In the early 1800's, on a Hebridean beach in Scotland, the sea exposed an ancient treasure cache: 93 chessmen carved from walrus ivory. Norse netsuke, each face individual, each full of quirks, the Lewis Chessmen are probably the most famous chess pieces in the world. Harry played Wizard's Chess with them in Harry Potter and the Sorcerer's Stone. Housed at the British Museum, they are among its most visited and beloved objects. Questions abounded: Who carved them? Where? 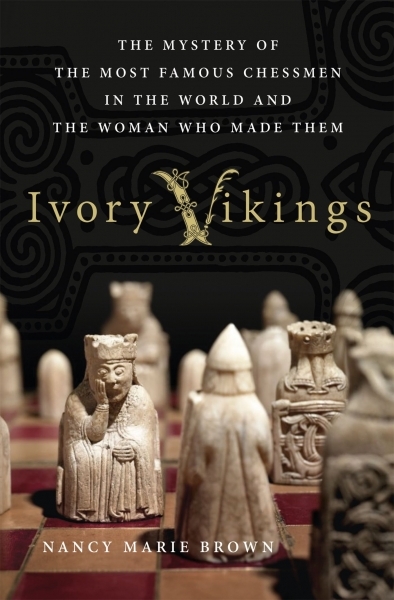 Ivory Vikings explores these mysteries by connecting medieval Icelandic sagas with modern archaeology, art history, forensics, and the history of board games. In the process, Ivory Vikings presents a vivid history of the 400 years when the Vikings ruled the North Atlantic, and the sea-road connected countries and islands we think of as far apart and culturally distinct. and finally, it brings from the shadows an extraordinarily talented woman artist of the twelfth century: Margret the Adroit of Iceland.